This tool provides a setup utility to install your Expert Advisor and its dependency files (e.g., DLLS, Indicators, Sound Files). 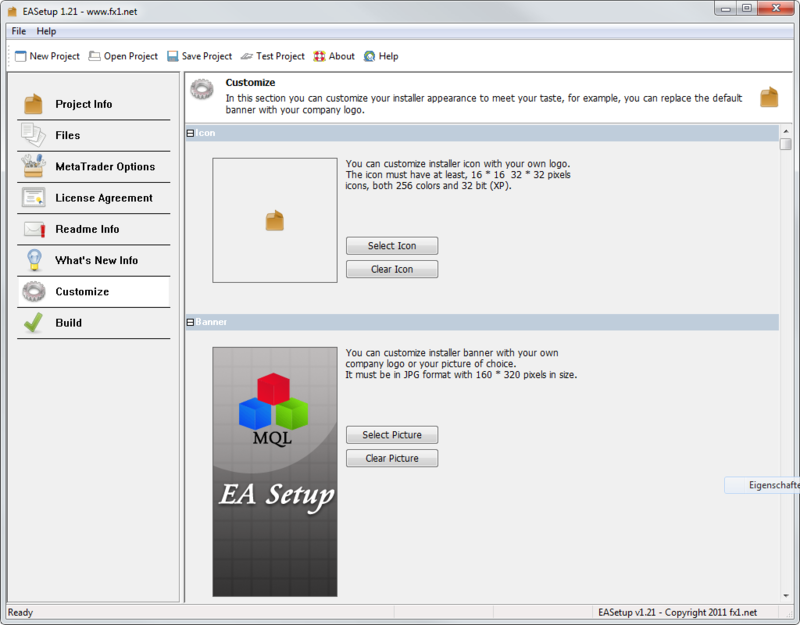 EASetup is designed to create a setup wizard for clients. 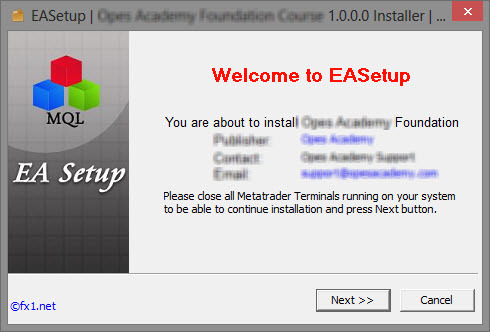 Sometimes installing or setting up projects in MetaTrader isn’t easy, but EASetup can guide you and your clients through the installation process. 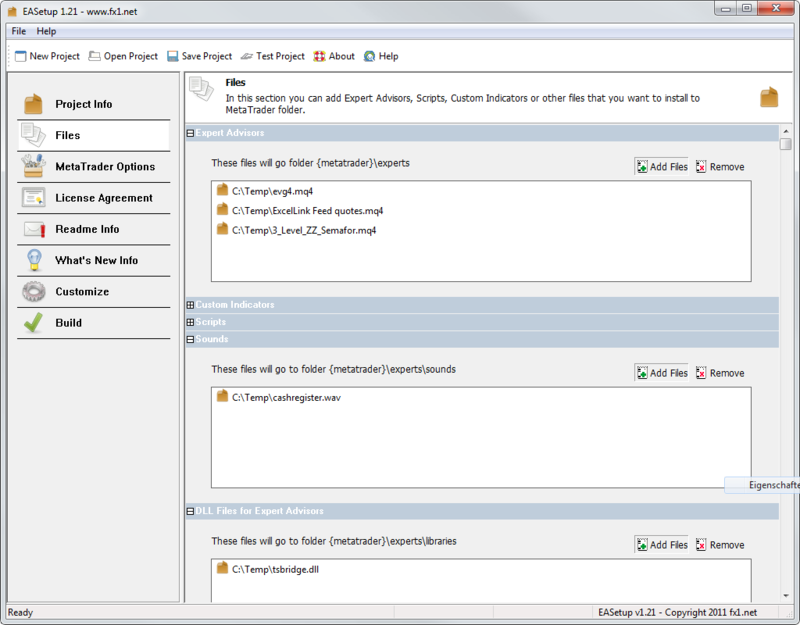 It can also install third party items such as DLLs, .exe files, sound files, and templates. You can postpone executions or set up the "Autostart" application instead. 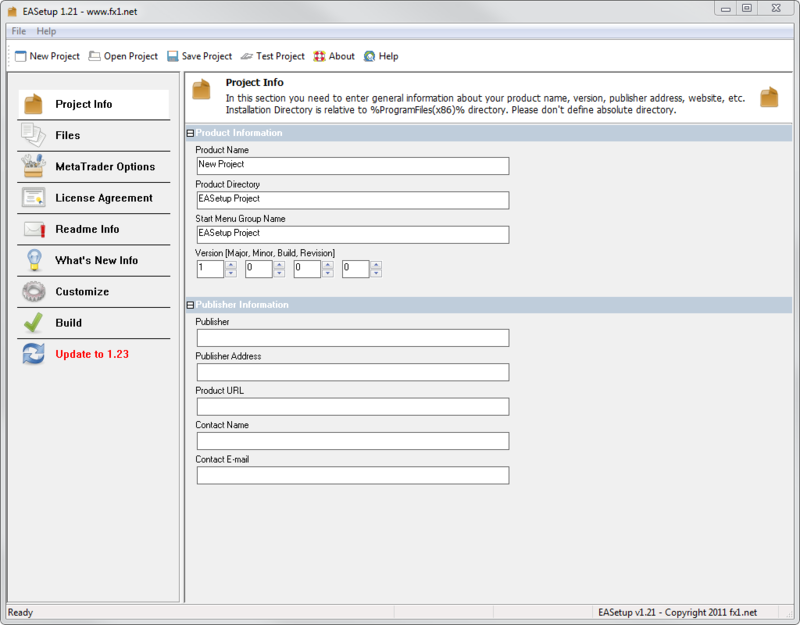 In addition, EASetup can help you create optional program groups. 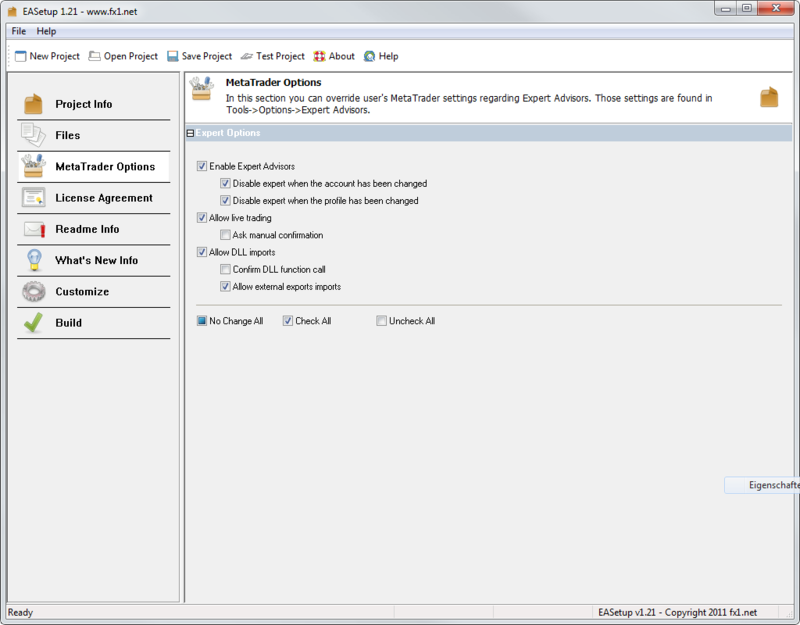 Define and set up "Autostart"
EASetup is freeware. Although it has everything you need to prepare, install, and uninstall projects and clients that use MetaTrader terminals, we are continuously designing enhancements for newer versions. Free version not time limited, you can use it forever for free. Our Gold Edition contains more feature than Free Edition. Beginning with version 2.52 its possible to generate a debugging log from installer. 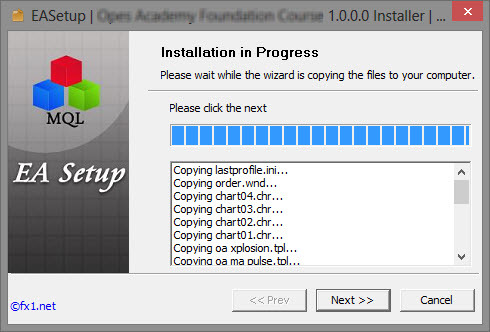 Installer is the setup.exe file which is the product of EASetup itself. How to enable debugging? From EASetup.exe check 'Debug mode' from Options menu. If you have any bug you want to report, please enable Debugging using this menu and send us easetup.log. Where will easetup.log file generated? File is located under %temp% folder. 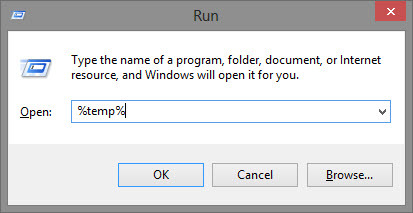 To reach %temp% folder press WIN+r and type '%temp%' and press ENTER. Inside this folder find easetup.log file and send us this file to support@fx1.net address. Of course we will also need your name, your version, your operating system & problem description. We need to know exactly whats the issue to be able to analyse the log file. 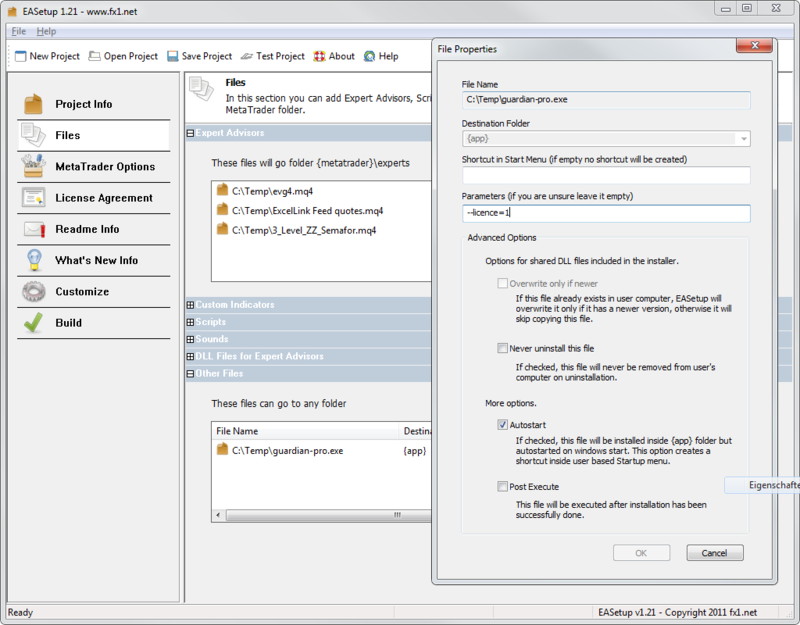 Metatrader all builds supported now! This version works with MT4 Builds > 520. Simultaneous installation of multiple MetaTrader4 terminals possible. Can I use EASetup with Metatrader5 ? A: We don’t support MetaTrader5 because the trader community didn’t accept it. Also, only a small group of people use MetaTrader5, so there’s no reason for us to support it. Can I use EASetup to install other application types? 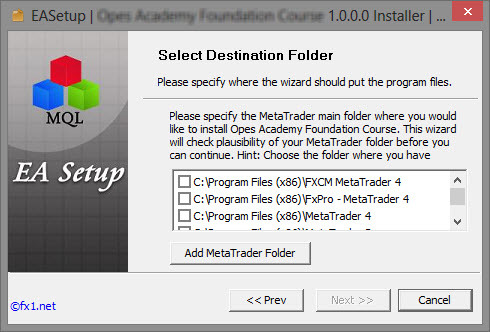 A: Yes, but EASetup was originally designed to install MetaTrader projects only. That’s its purpose. If you want to install other application types, please use another installer. Which MetaTrader versions do you support? A: We support all builds of Metatrader4. Whether you want insider trading strategies, need one-on-one consultation, require custom software development, or access to an expert with specialized knowledge, we’re ready to serve you in whatever way possible. © 2008 - 2019 - All Rights Reserved. Fx1 Inc.